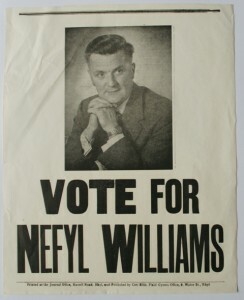 Nefyl Williams was Plaid Cymru’s first Parliamentary candidate in Flintshire, when the county was divided into two constituencies: East and West. He stood in 1959 in Flint West, which extended from inland St Asaph and coastal Rhyl and Colwyn Bay in the west to Holywell and Mold in the east and included numerous villages. Industrial Flint and Deeside and the detached rural area of Maelor beyond Wrexham (bordered mainly by Cheshire and Shropshire) were all in Flint East. I first met Nefyl in August 1958, when he chaired one of the discussion groups in the Summer School held in conjunction with the Party’s annual conference at Cyfarthfa Castle, Merthyr Tudful. Tall, silver-haired and soft-spoken, he made an immediate impression on me as he guided our deliberations with skill and patience. Little did I realize at the time that, within weeks, I would be part of Plaid’s organisation in his native north-east Wales. In the September I embarked on my teaching career in the county town of Mold and was soon invited to be a member of the Flint West Pwyllgor Rhanbarth (Constituency Committee). As I state above, Plaid Cymru first contested that constituency in 1959. It came as a surprise and a challenge to us, since we hadn’t thought of Rhyl, Mold etc as being promising politically. But Party President Gwynfor Evans thought otherwise. He came to a Pwyllgor Rhanbarth meeting and suggested in his gentlemanly but persuasive way that we contest the next election. I must confess that my immediate reaction was one of amused incredulity. But Gwynfor’s view prevailed. We have, by now, fought Flint West and its successor Delyn (minus St Asaph, Rhyl and Prestatyn but including Flint) ever since. Also Flint East from 1966 onwards (and the later Alyn and Deeside, minus Flint and Maelor), with Gwilym Hughes, my colleague at Ysgol Glan Clwyd, Rhyl (the country’s first Welsh-medium secondary school) as candidate on the first two occasions. Who was to be Plaid Cymru’s first candidate? Gwynfor proffered a name: Richard Hall Williams, lecturer at Connah’s Quay College of Further Education. He wasn’t a party member, but obviously highly regarded by Gwynfor (both hailed from Barry). Sadly, by now deceased, he was later responsible for agriculture at the Welsh Office, and his wife Nia became joint editor of the Welsh-language women’s periodical Hon with Marion Arthur Jones. The late Professor Stephen J. Williams famously and successfully defended its right to be so called when the publishers of She objected. ‘Hon’ did not mean ‘She’, he maintained, but ‘this feminine thing’. Who could argue with such a distinguished academic! To revert to Plaid Cymru and 1959. A three-man deputation was detailed to visit Richard Hall Williams at his home near the college. Led by Nefyl as Pwyllgor Rhanbarth chairman, it included Len Davies of Mold and myself. The clear understanding was that if our invitation were declined Nefyl would be candidate. Declined it was, amicably. So I hold the honour (?) of being among those few who first knew that Nefyl Williams was to be the party’s standard-bearer in that unpromising part of the country – all thanks to Gwynfor. Nefyl was a product of industrial Deeside and had been employed on strategic work at the John Summers steelworks in Shotton during World War II. He then qualified as a teacher and taught art at the Alun Grammar School, Mold. He and his wife Myfanwy learned Welsh as adults and ensured that their son Gwynfor received Welsh-medium education in a county which pioneered in the field, led by inspirational Director of Education Dr B. Haydn Williams. The Welsh spelling of his forename, clearly a modification of ‘Neville’, is an indication of his adherence to the national tongue. But, when Mold’s Ysgol Maes Garmon (secondary, Welsh-medium) was opened in 1961, he declined an invitation to apply for the post of Head of Art because, he said with typical and unnecessary modesty, his Welsh was not good enough. In the meeting held at Prestatyn to adopt Nefyl formally as candidate, he was introduced from the chair by the Reverend R.R. Jones as ‘Nefyl Williams B.A’, not in respect of his academic qualifications (he was not a graduate) but as a recognition of his personality: on this occasion ‘B.A.’ represented the words ‘bachgen annwyl’ [dear boy]. Nefyl was named on the ballot paper as ‘E.N.C. Williams’. The ‘E’ stood for Ernest; the ‘C’ for Coppack, a common Deeside surname. Those days, public meetings were held at election times. D.J. Thomas, stalwart Plaid member and head-teacher of Ysgol Hiraddug (the primary school at the village of Diserth) played a major part in this aspect of our campaign together with agent Miss Ceri Ellis. Times were arranged for the major towns and itineraries drawn up combining several villages each evening. D.J. also insisted that we hold a post-election ‘celebration’ at the Urdd Hall in Diserth to congratulate Nefyl on his vote. While the votes were being counted at the Alun School, those cast for the Labour candidate were so numerous that some of the space for Nefyl’s ballot papers was re-allocated to that party. ‘He’s doing jolly well’, observed Nigel Birch generously to me, pointing to the apparently strong support for Plaid Cymru. It did not please me to correct the impression wrongly conveyed! I was a newcomer to Flintshire when I started teaching there in September 1958; so I was not fully aware of the work done by Plaid members previously. It would therefore be invidious of me to mention any more names. In fact, I might never have been involved in the 1959 campaign at all. Nefyl, Ceri and I were all teachers employed by Flintshire County Council. So was Chris Rees, who, like me, was teaching at Ysgol Glan Clwyd at the time; he was released to be Plaid candidate in Swansea East (where he was to gain 10.5% of the votes). I had hoped to be agent to John Howell in the party’s first election campaign in Caerffili. But Flintshire’s Deputy Director of Education M.J. Jones (a long-standing Plaid member) thought it unwise for four teachers from the same party (two of them from the same high-profile Welsh-medium school) to be released. John’s agent in that election (with an 8.82% vote) was gas salesman Alf Williams, whom I refer to elsewhere in the Society’s website in connection with the illegal radio broadcasts of the 1960s. This entry was posted in Events on 28/02/2012 by admin.